In general, conventional error correction for inverse synthetic aperture radarimaging consists of range alignment and phase adjustment, which compensate range shift and phase error, respectively. Minimum entropy-based methods have been proposed to realize range alignment and phase adjustment. However, it becomes challenging to align high-resolution profiles when strong noise presents, even using entropy minimization. Consequently, the subsequent phase adjustment fails to correct phase errors. In this article, we propose a novel method for translational motion correction, where entropy minimization is utilized to achieve range alignment and phase adjustment jointly. And, a coordinate descent algorithm is proposed to solve the optimization implemented by quasi-Newton algorithm. Moreover, a method for coarse motion estimation is also proposed for initialization in solving the optimization. Both simulated and real-measured datasets are used to confirm the effectiveness of the joint motion correction in low signal-to-noise ratio situations. Inverse synthetic aperture radar (ISAR) imaging has been a widely addressed topic in last few decades [1–3]. In order to achieve high-resolution both in range and cross-range of target imagery, the ISAR imaging technique exploits both wideband characteristics of radar waveform and the diversity of viewing aspect angle from radar to the target. In general, the range resolution is proportional to bandwidth of waveform, and the cross-range resolution is dependent on both the coherent processing interval (CPI) and the target rotational motion from variation of radar viewing angles. Therefore, CPI should be long enough to achieve high cross-range resolution by Doppler analysis. In ISAR scenarios, the target is often engaged in complicated maneuvers and the translational motion should be compensated before performing imaging processing. Translational motion introduces range misalignment and high-order phase error. For ISAR imaging of a non-cooperative target, a data-driven compensation procedure must be accounted, which generally consists of range alignment and phase adjustment. Range alignment is to compensate the range shifts of profiles. Without priorknowledge available about the range shifts, range alignment is usually realized based on the similarity of high-resolution range profiles (HRRPs). Typical methods for range alignment can be sorted into three groups. The first class is based on a maximum correlation between adjacent profiles . The dominant scatter method tracks a prominent scatter and estimates the range shift. And, the maximum correlation method  aligns each HRRP by using the principle that the envelope correlation of two adjacent profiles reaches a maximum when they are aligned. Actually, the principle of maximum correlation of two adjacent profiles can be regarded as a local optimization of alignment. Because the estimation of range shifts between every two adjacent envelopes is independent of each other. As a result, this method is sensitive to target scintillation. And, it is likely to fail when strong noise presents, as the coherence of HRRPs is contaminated seriously. The other group is optimization-based methods [5–9]. It is widely accepted that global optimization methods are more robust to reflectivity scintillation and additive noise than maximum correlation method, in which the problem of ISAR range alignment is formulated by using some global metrics. Minimum entropy or maximum contrast of the synthetic profile, such as the average range profile (ARP) of the aligned profiles, is used as the criterion to evaluate the performance of range alignment. The synthetic profile usually has the highest sharpness when the profiles are aligned perfectly. Or else, the sharpness of synthetic envelope reduces. It is reasonable to evaluate the sharpness of the synthetic profile by contrast or entropy and establish an optimization for range alignment. In general, the synthetic profile is calculated as the mean of magnitude of the aligned HRRPs. Therefore, the synthetic profile can be viewed as a non-coherent energy accumulation of aligned profiles, and it can overcome the noise interference in some degree. However, in the situations of low signal-to-noise ratio (SNR), the SNR gain from the non-coherent integrant is not enough to overcome the interference from noise on the synthetic profile, leading to that the consistency between the sharpness of the synthetic profile and the quality of range alignment is broken. In this sense, it is still challenging to achieve optimal range alignment in presence of strong noise. If range alignment is done well, afterwards, phase adjustment is carried out to remove the error phase. There are many different schemes to perform phase adjustment, which can be sorted into different groups. The first is based on tracking a phase of dominant scattering centers. Phase gradient autofocus algorithm , the multiple dominant scatters algorithm , and the weighted least square phase estimation  can be classified into this group. These methods usually perform well when dominant scattering centers can be extracted from HRRPs. However, presence of strong noise brings inherent difficulty to precise phase tracking through several dominant scatters. Another group numerically optimizes the phase error correction to improve a global metric consistent with image focus, in which image contrast (IC) [13–16] and entropy [17–22] are utilized as the cost function to optimize the phase error. Image metric-based approaches are usually able to obtain an optimal solution even in the presence of strong background noise and clutter. However, successful phase adjustment can only be ensured when perfect range alignment is obtained, while if the profiles are misaligned in some cases, such as strong noise situation, even the image metric-based methods fail to correct phase errors. To overcome this problem, in , a joint correction scheme for simultaneous range alignment and phase adjustment was proposed based on a two-order polynomial model of the translational range history, and a novel coarse estimation of both velocity and acceleration was also developed to accelerate the motion estimation. 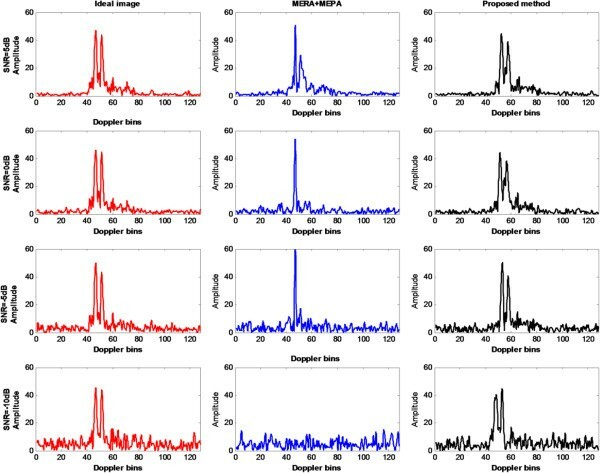 In the issue of ISAR motion compensation, adaptive joint time-frequency algorithm (AJTFA) also plays a significant role in ISAR motion compensation and imaging processing [11, 23, 24]. Especially, AJTFA is inherently suitable to dealing with maneuvering targets by projecting the one-dimensional signal onto the two-dimensional (2D) time-frequency plane, and the motion parameters can be extracted from the time-frequency spectrum of dominant scatters. However, strong noise can easily submerge the time-frequency spectrum degrading its performance in low SNR scenarios. In radar remote sensing, strong noise usually presents, due to the signal decay from long range and absorption of transmit medium. The SNR problem is among the most significant challenges that ISAR imaging systems frequently face. In the presence of strong noise, motion compensation for ISAR imaging inherently encounters some difficulties. Therefore, the technique of motion compensation under low SNR is important, which may furnish imaging capability and improve the effective operating range of some ISAR systems with low power. Based on the fact that both range shift and phase error are directly related to the quality of the focused image, in this article, we present a novel entropy-based approach to joint range alignment and phase adjustment. It should be emphasized that the idea of joint correction of range shift and phase error has been proposed in , which motivates this study. In the joint correction, instead of separating motion compensation into the two dependent steps, it estimates the range shift and phase error simultaneously. Therefore, high SNR gain from 2D coherent integrant is benefited by both range alignment and phase adjustment. In this article, the joint correction with entropy minimization models the translational motion as a high-order polynomial function , and 2D image entropy is minimized to optimize the polynomial coefficients. 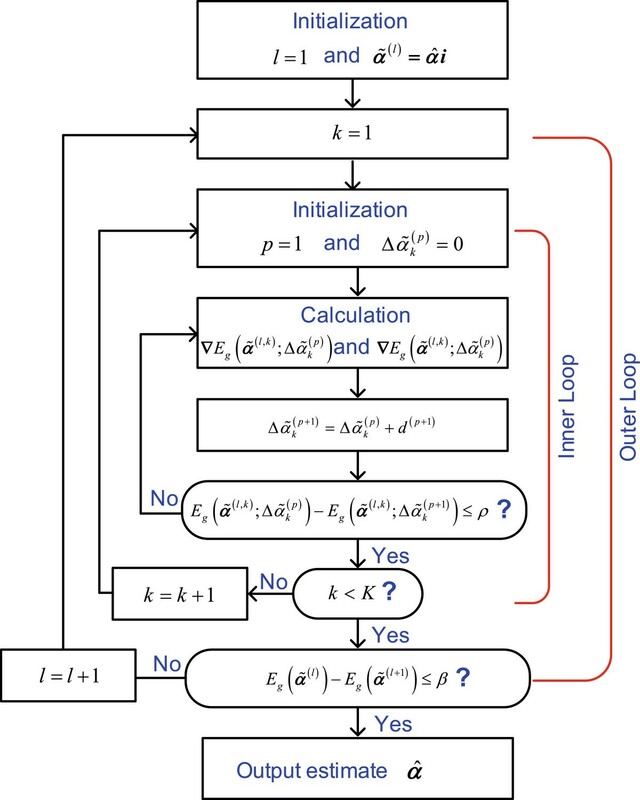 A novel coordinate descent algorithm is proposed to solve the minimum entropy optimization. The coordinate descent algorithm is implemented by the quasi-Newton algorithm, yielding fast convergence. For an optimization problem, the initialization is usually important to the efficiency and precision of the solutions. In this article, we also propose a method to estimate a coarse motion, which is effective to obtain the coarse coefficients efficiently. They can be applied as additional information to accelerate and promote the coordinate descent estimation. By using real datasets, the effectiveness of the joint motion compensation is validated. The organization of this article is as follows. In “Signal model and minimum entropy compensation methods” section, we introduce the signal model and recall some existing minimum entropy-based methods for translational motion correction. In “Joint range alignment and phase adjustment by minimum entropy” section, algorithm for joint range alignment and phase correction by minimum entropy is illustrated in detail. 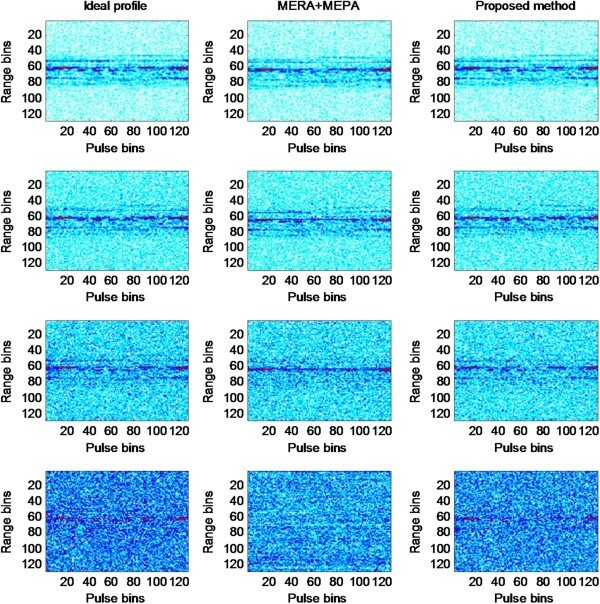 Experimental results from both synthetic and real data processing are given in “Performance analysis” section to illuminate the effectiveness of the proposal. In the last section, some conclusions are drawn and some future works are viewed. ISAR geometry. (a) Three-dimensional geometry. (b) Simplified 2D geometry. are the range migration and phase error corresponding to the n th pulse, which are expected to be corrected in the range alignment and phase adjustment, respectively. We focus on motion compensation for ISAR imaging under low SNR, which has been gained noticeable interests till now. To overcome the interference of strong noise and clutter, current methods are usually following a similar principle, in which, estimation of errors is converted into a problem of minimizing (or maximizing) a cost function. And, the cost function is selected such that when it is minimized (or maximized), optimal focusing is achieved. Entropy is one of the most primary function in error compensation for ISAR imaging. Entropy of 2D image (or one-dimensional synthetic range profile) represents its sharpness, and generally the “sharpest” image is corresponding to the fully focused image (or aligned HRRPs). Before presenting our method, herein, we introduce two typical entropy-based methods for range alignment and phase adjustment, respectively. The optimal solution of range shift is estimated by minimizing the entropy of the synthetic profile. In order to solve the optimization problem in (16), many searching approaches have been proposed by adopting exhaustive search or iterative search. It is performed to solve the following optimization to estimate the phase error. Many searching approaches have been proposed to solve the minimization problem in Equation (21). Especially, three schemes are introduced in  in detail. Although they have different searching schemes and efficiencies, their performances are similar as the underlying principle is the same. In general, minimum entropy phase adjustment is implemented by an iterative solution, the image entropy decreases with the increase of iteration number until the estimate reaches an acceptable optimal convergence. where one notes that k begins from 1 to K. The first-order term is corresponding to the velocity. Velocity only induces an additional Doppler, causing a bulk shift of the image in the Doppler domain. However, it brings serious range migration, which is expected to be corrected in the conventional range alignment step. And, the presence of the high-order terms introduces both range migration and phase errors. Based on the polynomial translation model, we rewrite the signal in (10) as follows.
. The estimate of α is obtained by minimizing the image entropy, expressed as follows. To solve this optimization, many standard algorithms are available, such as gradient-based algorithms, genetic algorithms, and gold section search. 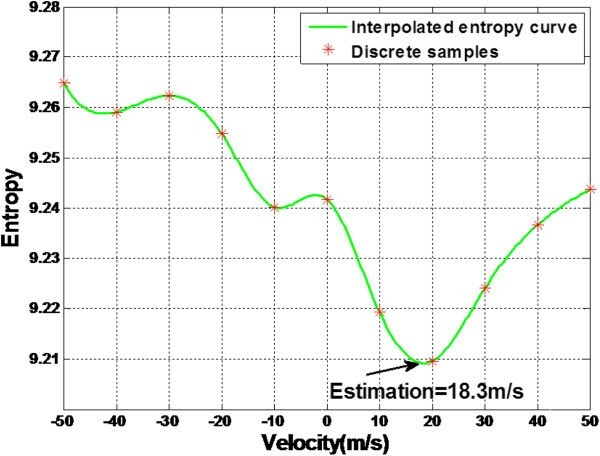 Due to the random characteristics of noise, it contributes little to the variance of entropy during the motion estimation [19, 22]. And, some dominant scatters will exceed the noise in amplitude distinctively due to energy accumulation when optimal motion correction is achieved, enhancing the sharpness of image significantly. Therefore, minimizing the entropy of 2D image for error correction is reasonable. Due to the strong noise interference, the cost function is usually not convex along with a lot of local minimums. Straightforwardly, utilizing the standard optimization algorithms encounters high risk that the iteration is trapped into a local minimum that far away from the true solution. In this article, we propose a coordinate descent algorithm implemented by quasi-Newton algorithm. The coordinate descent algorithm sequentially minimizes the objective function with respect to a single parameter while holding the remaining parameters constant. By this, coordinate decent algorithms have monotone convergence in the objective function and trend to have the ability of achieving the global optimization . be the estimate of the phase parameters at the l th iteration where the first k − 1 polynomial coefficients have already been updated. , we have the corrected image as follows. , where ρ is a parameter small enough for the pre-determined threshold or p reaches a pre-determined maximum iteration number P. For computational efficiency, fast Fourier transform should be used in the implementation of the calculation above.
. The polynomial coefficients are updated by the quasi-Newton algorithm sequentially, and for the update of each coefficient, several iterations are needed. As a result, we need to perform the translational motion correction and image processing several times for every component, and high computational load may be involved. However, the monotone and fast convergence is usually achieved by the coordinate descent algorithm even under low SNR, and as we apply the quasi-Newton algorithm in the inner loop, its fast convergence also promotes the algorithm in efficiency. It should be emphasized that we usually have no additional knowledge of the translational motion in reality, and the polynomial order K should be selected manually or adaptively. A pre-determined order should be high enough to model the real motion, which causes high computational complexity. In the following section, we will develop an adaptive selection approach. Flowchart of the coordinate descent algorithm. are smaller than a pre-determined threshold. The threshold is so small that the motion under it does not change the image entropy. In general, a threshold of 1e-3 is usually a good choice in reality. Coarse estimation of α ˜ i .
Flowchart of the coarse motion estimate. In , a novel joint correction approach to motion estimation is developed, which models the translational motion as a two-order polynomial function determined by the radial velocity and acceleration. And, a novel coarse estimation method is also developed, where the radial velocity and acceleration are estimated by Radon Transform (RT) and IC, respectively. Utilizing RT for velocity estimation is very similar to the Hough-based range alignment approach . Assuming the linear migration of the range profiles is mainly induced by the radial velocity, the velocity can be determined by the slope of range profiles estimated by RT . Subsequently, maximum IC optimization is applied to obtain the radial acceleration. RT is capable of providing precise estimation of the radial velocity, as it accumulates energy of signal in a non-coherent way. However, its precision degrades with the increase of the noise. And, strong noise can submerge the range profiles causing that the SNR gain from non-coherent accumulation would not be great enough to achieve accurate velocity estimation. Subsequently, the acceleration estimation with contrast maximization fails. Obviously, the proposed coarse motion estimation with minimum entropy achieves the high-SNR gain from the coherent accumulation since it evaluates the entropy of the final ISAR image. On the other hand, the minimum entropy approach iteratively estimates the motion coefficients in sequence via the linear search, which is deemed to involve relatively large computational load. In this sense, the proposed coarse estimation should be workable under lower SNR than the RT and IC method at a price of increased computational load. To present the superiority and shortcoming of the proposed approach for coarse motion estimation under low-SNR conditions, herein we use synthetic data for comparison. The synthetic data are generated by adding different Gaussian white noise into the real Yak-42 dataset (the dataset will be depicted in the following section), yielding SNR = −7 dB and −10 dB. The velocity and acceleration of the target are set as 20 m/s and 8.5 m/s2, respectively. Then, both of the coarse motion estimation approaches are utilized to obtain the radial motion coefficients. In the case of SNR = −7 dB, both of them work well, providing precise estimation of both velocity and acceleration. In Figure 5a, we plot the ideal radial range together with the estimated ones. From Figure 5a, one can note that the estimations are very close to the idea radial range curves. And, the RT and IC-based method performs only slightly worse than the minimum entropy method. However, as shown in Figure 5b, when SNR decreases down to −10 dB, the RT and IC-based coarse estimation fails, while the performance of the minimum entropy method maintains. It should be noted that about five iterations are needed to ensure the convergence of the minimum entropy-based initialization, and its computational load is over five times that of the RT and IC-based method. Both of them are coded in Matlab language with the same computing environment. In experiments, we find that the RT and IC-based coarse estimation fails when SNR decreases below −8 dB, while the minimum entropy-based coarse estimation is still workable until SNR decreases down to −12 dB due to high-SNR gain from the coherent accumulation. For both maximum contrast and minimum entropy optimization, the initialization step is so essential that only an effective initialization ensures precise estimation by using gradient-based optimization algorithms. And, the proposed coordinate descent algorithm and the one utilized in  are not exceptions. In this sense, the convergence of the optimization algorithms to the global optimization depends on the coarse estimation significantly. Because both entropy and contrast functions show good convexity and smoothness only near to the global extremum and strong multimodal behavior presents in the position far from it. Moreover, the fluctuation phenomenon of cost function becomes furthermore distinctive when noise increases. In low-SNR situations, optimal coarse estimation is capable of accelerating optimization algorithms to reach the global optimization. On contrary, a bad initialization would lead the algorithms to be trapped within a local optimal point far away from the global optimization. 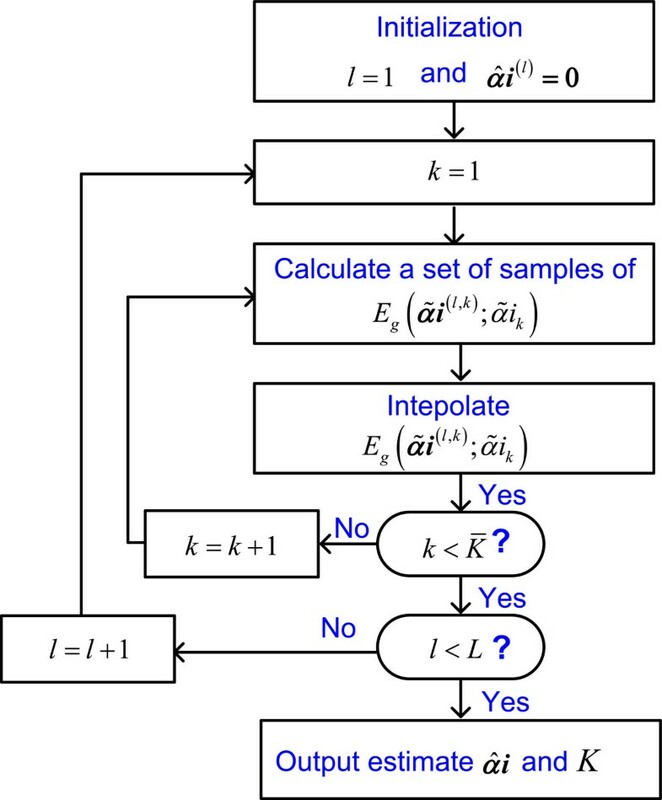 To further demonstrate this, we provide the image results under different SNRs by using the maximum IC method in  and the proposed minimum entropy method. In the maximum IC method, after the RT and IC initialization, maximum IC optimization is solved by the Nelder and Mead’s method . And, in our scheme, the coordinate descent algorithm is applied after the minimum entropy coarse compensation. In Figure 5c, we present the ideal image and images obtained by the two methods under SNR = −7 dB. They are arrayed from left to right in sequence. And, Figure 5d shows the results with SNR = −10 dB. In the case of SNR = −7 dB, since both the initialization algorithms perform well, the starting guesses are close to the global optimization, and we also find that it is very flexible and simple to set parameters (such as reflection and expansion coefficients in Nelder and Mead’s method) in both maximum IC and minimum entropy optimizations. And, both of them achieve well-focused images. However, in the case of SNR = −10 dB, as the RT and IC initialization fails to provide an effective initialization for the Nelder and Mead’s approach, it consequently fails to achieving the true motion coefficients, leading to blurred image, while thanks to the 2D coherent integrant SNR gain, minimum entropy initialization provides precise coarse coefficients, and the coordinate decent algorithm reaches the optimal convergence with only about three iterations. And, the resulting RD image after correction is very close to the ideal one as shown in Figure 5d. From the comparison, we can conclude that, in low-SNR circumstances, initialization is essentially significant for metric optimization-based motion compensation. Since strong noise usually induces fluctuation in the cost function and it is only smooth near to the global extremum. Only effective initialization can support the following fine estimation by deterministic optimization algorithms to get the global optimization. And we should also note, this dependence of initialization may be reduced by heuristic optimization algorithms, such as genetic algorithm  and particle swarm optimization  at a price of increased computational load. Comparison of approaches under different SNRs. (a) Coarse motion estimation under SNR = −7 dB. (b) Coarse motion estimation under SNR = −10 dB. (c) RD images under SNR = −7 dB. (d) RD Images under SNR = −10 dB. In this section, real datasets are used to evaluate the performance of the joint range alignment and phase adjustment for ISAR imaging. Contrast, entropy and peak value of the focused RD images are used as the evaluation criterion of the image quality. First, the Yak-42 data are utilized to analyze the performance of the proposed method. High-order polynomial motion and different noise are added into the data, and the motion compensation is performed by both the conventional minimum entropy-based methods and the proposal. Comparisons are also provided to illuminate the improvement of our method. A ship data with strong sea clutter is also used to confirm the effectiveness of our method. All results illuminate that the enhanced quality is achieved by the joint correction. The dataset of the Yak-42 airplane is recorded by a C-band (5.52 GHz) ISAR experimental system. The system transmits 400 MHz linear modulated chirp signal with 25.6 μs pulse duration, providing a range resolution of 0.375 m. In the dataset, the pulse repetition frequency is 100 Hz, i.e., 128 pulses within dwell time [−0.64, 0.64] (s) are used in the following experiment. Conventional motion compensation, including MERA  and MEPA , is performed to remove the translational motion. Due to high SNR (up to 22 dB) of the raw data, both of them perform well. The aligned profiles are shown in Figure 6a. 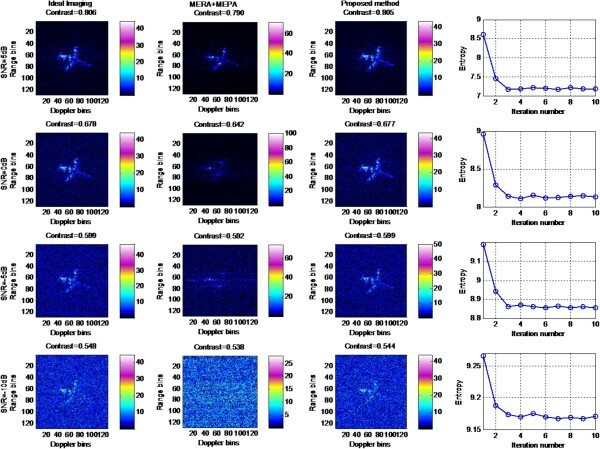 And RD image is shown in Figure 6b for evaluating the experimental results. Experimental dataset. (a) Aligned range profiles. (b) RD image via MERA + MEPA. (c) Range profiles with motion error. Experimental results with Yak-42 dataset. Range profiles after translational motion compensation. Image corresponding to the range bin with two dominant scatters. 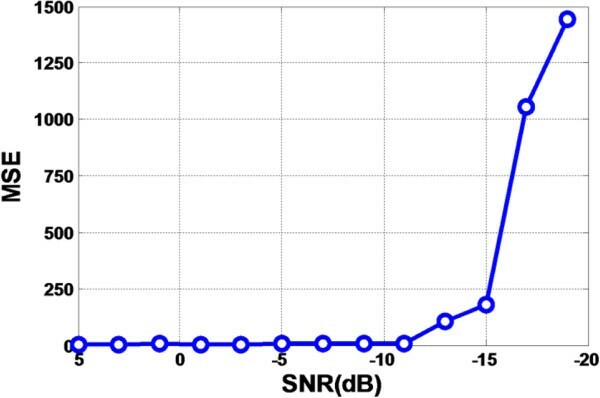 The MSEs corresponding to different SNRs are plotted in Figure 10 which presents that the joint correction provides very small MSE only when SNR is above −12 dB. As mentioned in the last section, in the joint minimum entropy correction, coarse motion estimation for initialization is very essential, as only good initialization can avoid the coordinate descent algorithm being trapped in a local minimum of the entropy optimization. In these experiments, five iterations are used in the initialization estimation and order determination according to the procedure in Figure 4, consuming CUP time of coarse motion estimation corresponding to different SNRs is 1.13, 1.16, 1.86, and 2.17 s, respectively. For clarity, the estimated radial ranges from the coarse motion estimation under different SNRs are presented in Figure 11. From Figure 11, one can note that effective coarse motion estimation is achievable even SNR decreases down to −10 dB, and the estimate accuracy degrades slightly with the increase of strong noise. For this dataset, the initialized estimates give high accuracy until SNR decreases below −12 dB, which also leads to failure of the coordinate decent algorithm for fine translational motion correction subsequently as we mentioned before, because the relationship between focusing quality and image entropy is inconsistent when very strong noise is involved into the data. And the entropy of image almost relies on the strong noise only, which is independent of the motion correction. 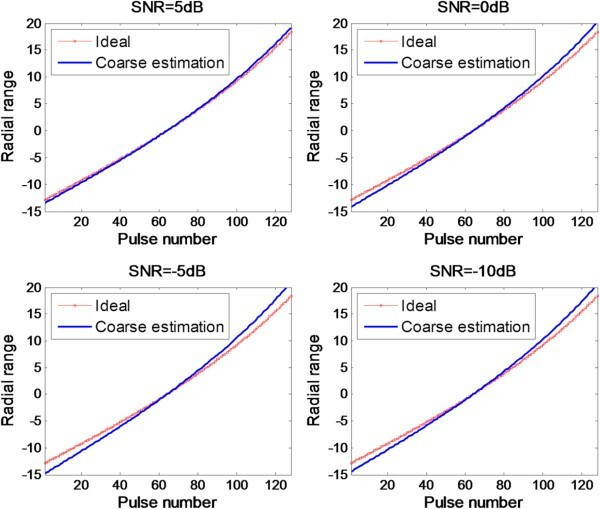 In this situation, one can use more pulses to obtain high-SNR gain, and then optimal motion correction and well-focused image may be generated by the proposed method. However, more pulses means longer CPI, which may lead to the 2D rotation model in Figure 1b being not rigid to apply. It should be considered in extremely low SNR scenarios. Coarse estimation by the minimum entropy. The generation of high-resolution ISAR images of ships is usually challenging due to random perturbing rotational motions in pitch, roll, and yaw . Another adverse factor relies on interference from strong clutter noise, which is usually strong enough to degrade the performance of conventional correction methods. Herein, we demonstrate the enhanced performance of joint range alignment and phase adjustment based on minimum entropy to deal with real ship data. The dataset is measured by an airborne synthetic aperture radar system, some radar parameters are listed as follows: the signal carrier frequency is 15 GHz with a bandwidth of 800 MHz to provide range resolution of 0.1875 m and the pulse repetition frequency is 125 Hz. 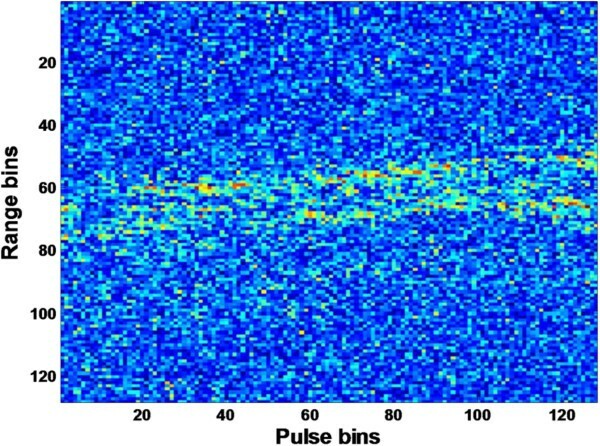 The numbers of pulse used in the experiment is 128. Figure 12 shows the HRRPs with motion error. Clearly, due to strong background clutter, the HRRPs are dim. 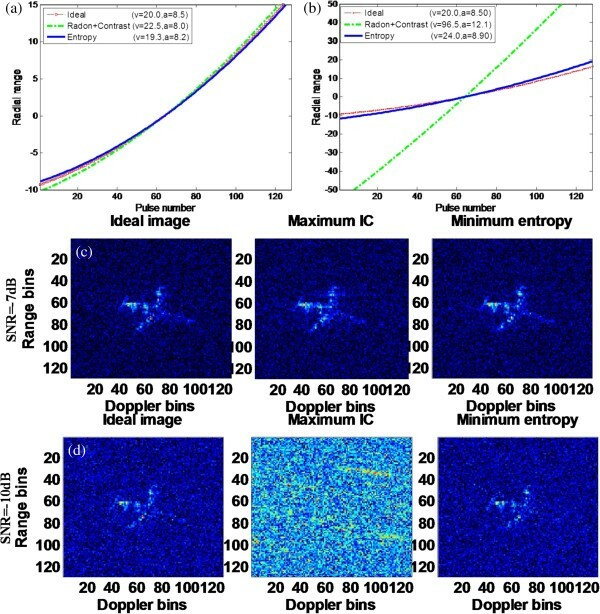 Figure 13a shows the RD image obtained by MERA and MEPA with contrast equivalent to 0.577, and Figure 13b shows the RD image generated by the joint correction, with larger contrast equivalent to 0.589 at a price of a little computation increase. From this comparison, we believe that improvement is achieved by the joint correction and it is useful in processing the ship ISAR data. Aligned HRRPs of a ship. RD image comparison. (a) RD image obtained by conventional minimum entropy methods. (b) RD image obtained after joint range alignment and phase adjustment. In this article, we focus on the error correction under low SNR for ISAR imaging. It is widely accepted that minimum entropy-based phase correction is very robust to noise due to the high-SNR gain from the 2D coherent integral in image generation. Inspired by this, a novel scheme is established by using the 2D image entropy as the penalty function to jointly optimize the range shift and phase error. Implemented by quasi-Newton algorithm, a coordinate descent algorithm is developed to estimate the high-order coefficients of the translational motion. To avoid being trapped into a local minimum far away from the ideal solution, a novel method for coarse motion estimation is also proposed. Coarse motion usually provides solution close to the global optimization, leading to significant iteration number decrease in the fine estimation. Utilizing a parametric model on the range history, the proposed method performs well under strong noise. However, this model restricts the translational motion model, leading to limitations on specific scenarios. For example, severe vibration of the target or radar platform could induces random range shifts and phase errors. In this case, random translational motion compensation for ISAR imaging under low SNR is still open. ∂ g * k , h ; α ˜ l , k ; Δ α ˜ k ∂ Δ α ˜ k = ∂ g k , h ; α ˜ l , k ; Δ α ˜ k ∂ Δ α ˜ k * . ∂ 2 g k , h ; t e ; ϕ ∂ Δ α ˜ k ∂ Δ α ˜ k = − 16 π 2 NM ⋅ ∑ n = 0 N − 1 exp j 2 π hn N ⋅ ∑ m = 0 M − 1 exp j 2 π km M ⋅ s c m , n ; α ˜ l , k ⋅ exp j 4 π Δ α ˜ k ⋅ n ⋅ Δt k c ⋅ m ⋅ Δ f r + f c ⋅ n ⋅ Δt 2 k ⋅ m ⋅ Δ f r + f c c 2 .
b α ˜ l , k ; Δ α ˜ k = − 1 S g ∑ k = 0 M − 1 ∑ h = 0 N − 1 1 g k , h ; α ˜ l , k ; Δ α ˜ k 2 ⋅ ∂ g k , h ; α ˜ l , k ; Δ α ˜ k 2 ∂ Δ α ˜ k 2 . The authors thank the anonymous reviewers for their valuable comments to improve the paper quality. This study was supported by “973” program of China under grant 2010CB731903 and National Natural Science Foundation of China under grant JJ0200122201 and 61179010. Lei Zhang's work was also supported by the Fundamental Research Funds for the Central Universities under grant K5051302001 and K5051302038.